Tonight was the crucially important first U.S. Presidential debate of for the 2016 election and you know what that means! Yup indeed, Ignoring the sad state of humanity and playing with clocks. I’ve gotten her quite spruced up since that first day I took her out of the box, and I’m happy to say that none of the mechanical parts seem to be broken. The hands, dial, and decorative wood are broken but those aren’t really what I’m here for anyway. It took a while to figure out how all the pieces fit back together (see last week’s picture) but I think I have it now. 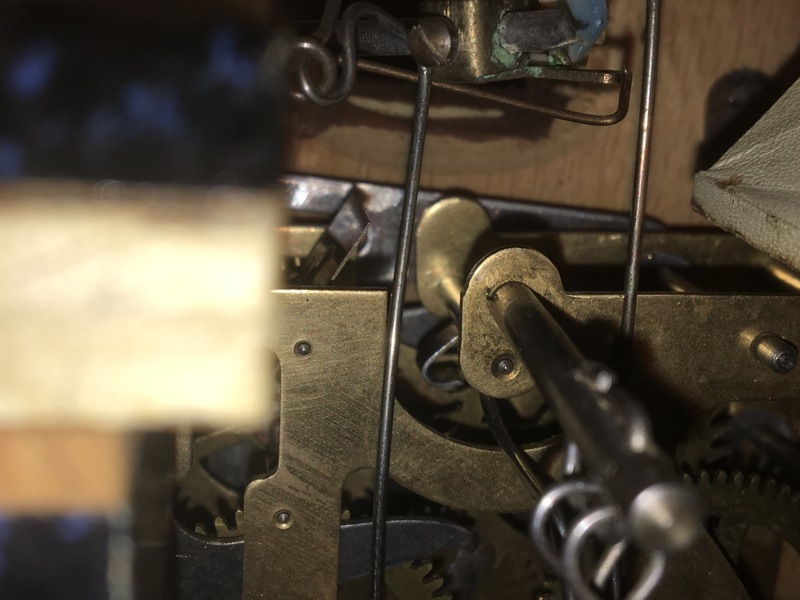 I have to admit – for the chiming train pieces on the front of the movement I did sneak a peak at an original picture I took 😑 I just couldn’t figure out how those silver-colored pieces would count down the hours properly, all while prompting the Cuckoo movement as well. 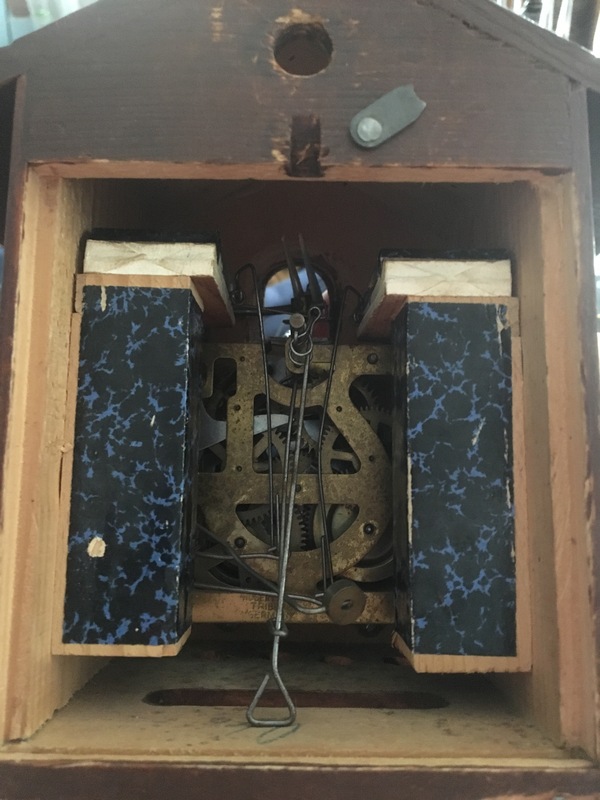 I see now the intricacies of a cuckoo clock and why they don’t appeal to all horologists- there are just way too many moving parts that are nonessential to the movement itself. 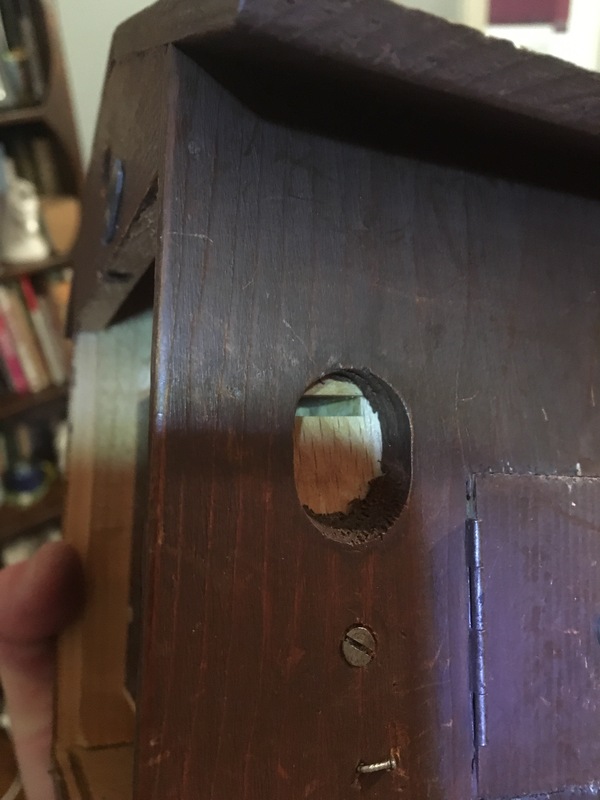 If you look to the left side of the image above, you’ll see how I ended up bending a piece of brass to hook better onto the Cuckoo part. The thing is, it shouldn’t be that hard to make a clock do an easy function (in this case, swing a bird in a half circle) at given times, yet it seemed like some of the pieces were redundant. 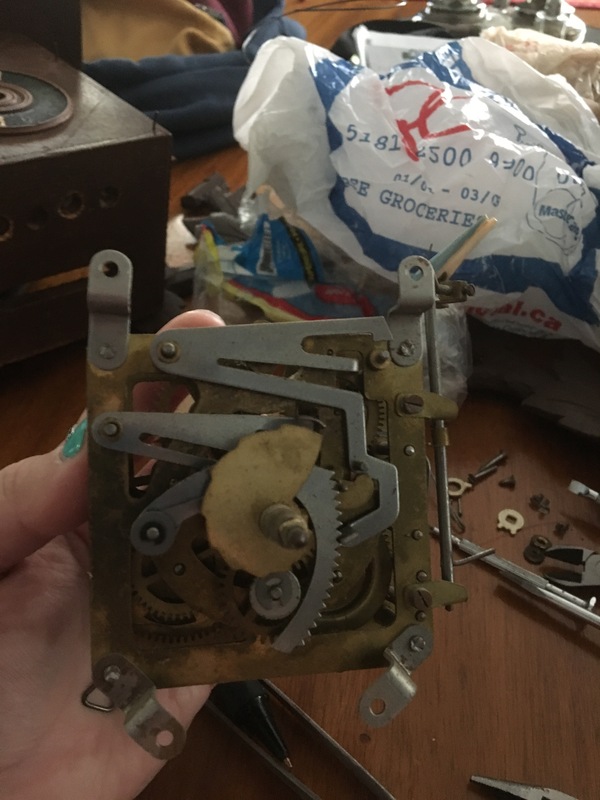 The pieces on the front that counted hours are an annoyance I’ve come to accept in other clocks. Part of me doesn’t care about them – if it runs it runs, right? But then if I hear a deeply permeating gong sound or some sweetly tinkling Westminster chimes I decide that maybe counting hours is useful after all. A part I definitely disliked is the bird sound made by what I have dubbed the ugly faux-marble styrofoam bird whistles. 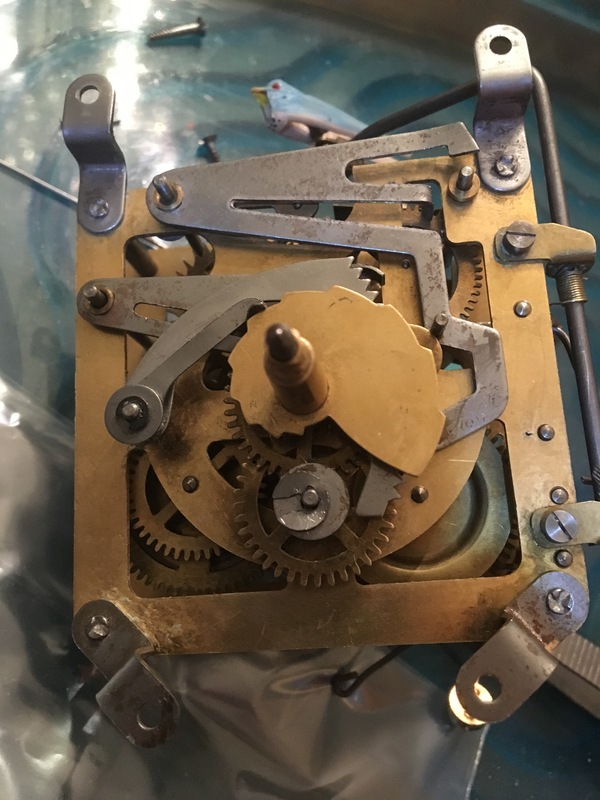 When I first opened the clock I didn’t see a purpose to them besides padding the movement, and I wondered at the hooks (top center) connecting them to the bottom left side of the back of the movement, shown above. I now see that the top of each faux-marble styrofoam is a small bellows which opens as the movement turns a certain amount. As it falls closed it emits a sound like a bird whistle, hence the unusual holes at the sides of the clock case. I had an unnecessarily hard time getting the chains on the movement. 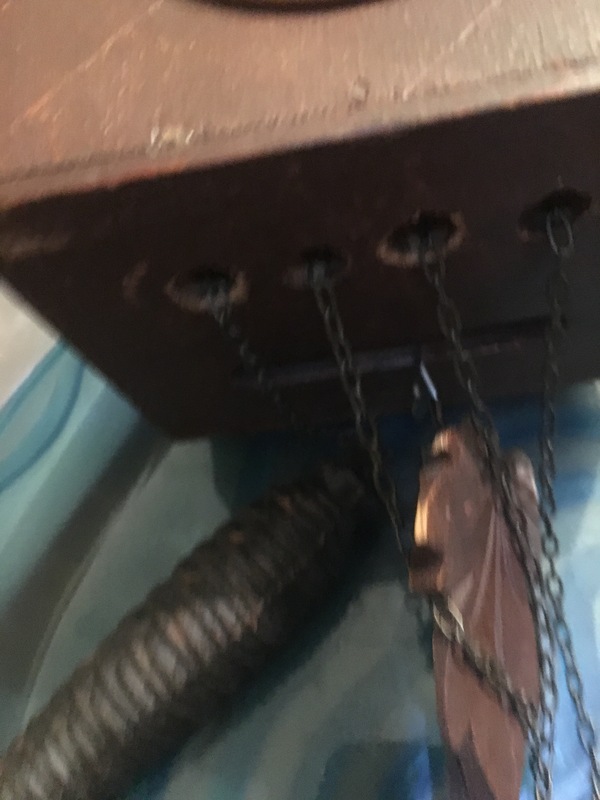 I realize now that I obviously should have checked the movement with the weights before inserting it in the clock (which is a tight, confined area not easy to work in), but I was busy trying to figure out the purpose of the ugly faux-marble styrofoam bird whistles. I have yet to see the clock run. 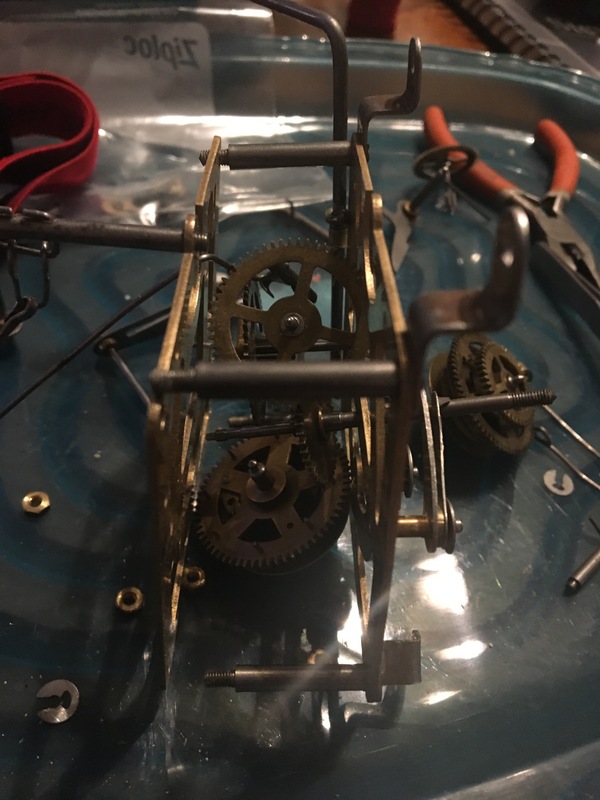 The escapement doesn’t seem to want to turn a regular time, even after figuring out the pendulum. 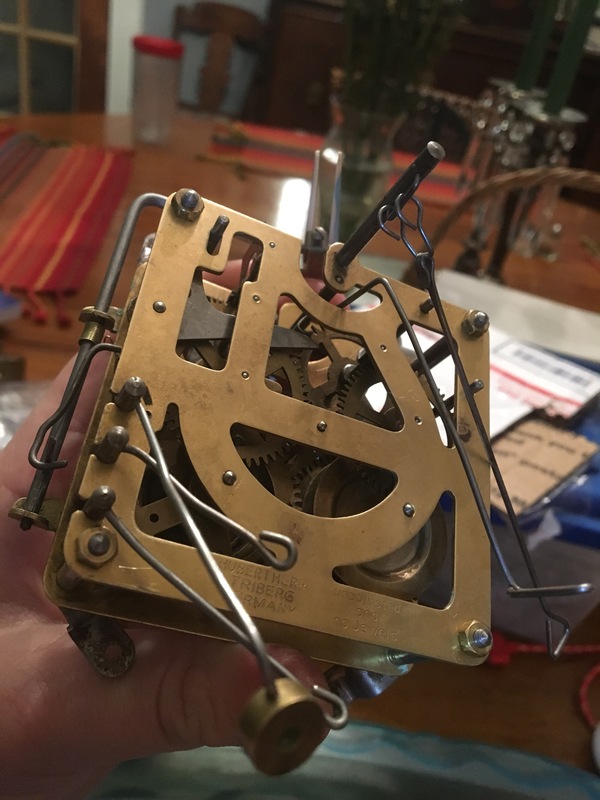 I know that I’ll have to take the weights off, the movement out of the case, and figure out why the weights aren’t encouraging the escapement to move. It looks a little strange to me now so I suspect there’s something silly wrong, like a backwards piece or a bent something-or-other. Oh, if only it could be that easy – I’d rather have made a simplistic mistake than have remaining misunderstandings about the movement. I do like, so far, how the chain of the weights catch the gears. I’ve seen weight-driven gears wind with string (on a gorgeous Perry Hger Morbier from Monflanquin, France that I’d love to show off soon) and I like this method much better because it seems to be very impervious to accident or error. Straight ahead you can see the dead-beat escapement not catching on the toothed gear, and hopefully I can fix that.